Indian wedding wear is evolving like never before. Over the last couple of years there are been a sea of change. Cut out Excess. Bring in Exclusiveness. Earlier, elaborate outfits embellished with embroidery and bling ruled. Heavier the silk, the better it was considered. The focus has now shifted to lightweight fabrics, with more focus on cut and style. Delicate work, hybrid cuts and dreamy volume created with sheer fabrics have taken over. What has instigated such a drastic shift? Falguni explains. “Wedding gowns have Western influences with traditional interpretations. They are extremely comfortable compared to heavy saris and lehengas. They can be worn to cocktails, formal dinners and wedding functions as well”. Brides are open to new colours and styles. Deep red, pink and burgundy are not the only colours defining a wedding. They are going for blue, green and even neon tints. There is a move towards hues like champagne, metallics, nudes and deeper jewel tones. “Some women avoid cream and black but there are a few who are breaking the rules”, adds Vallya. Flowing pre-stitched fusion sarees, lehengas with a western touch, unusual fits and cuts are the call of the day. Bollywood pays a big role. Consider standing out, not blending in. There has to be a sense of drama and a stamp of exquisiteness. Men are breaking away from traditional wear and have come into their own too. Sherwanis have undergone a face-lift along with the saree. It’s all about elegance, not flamboyance. “The big colours for men are jewel tones, plum, purple and burgundy”, says Rathod. Look at lehenga gowns and dhoti-sarees. There are a medley of concepts out there. Just remember that it’s not excess that makes the difference. It’s about exclusiveness. Brides Wear Western. Grooms Go Eastern. 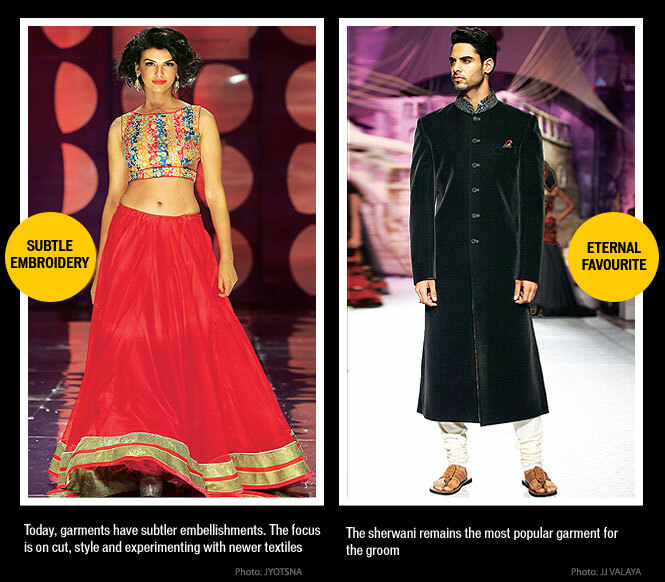 While bridal wear fuses in a western touch, groom are discarding western suits for a more ethnic interpretation. South Asian men look good in South Asian outfits. Nowhere is this more visible than in South Asian festive occasions and weddings. With more and more men focusing on fitness, a sea of options have opened up in silhouettes, pyjamas, flared kurtas and bandgalas. “I like old-world clothes. That’s why I gave actors Varun Dhawan and Siddharth Malhotra a traditional Punjabi salwar-kurta, and pyjama kurta in Student of the Year. These have become huge hits with men, who wanted a change. Films are making these trends more accessible”, says Manish Malhotra, the fashion trend setter in Bollywood. Rathore prefers to experiment with a variety of trousers for men from breeches to Pathani, Patiala or Pakistani salwar, churidar or dhoti. “Team them up with bandhgala jackets, achkans, and waistcoats over your kurta or shirt” he advices. Lehengas are not relegated to the reception. 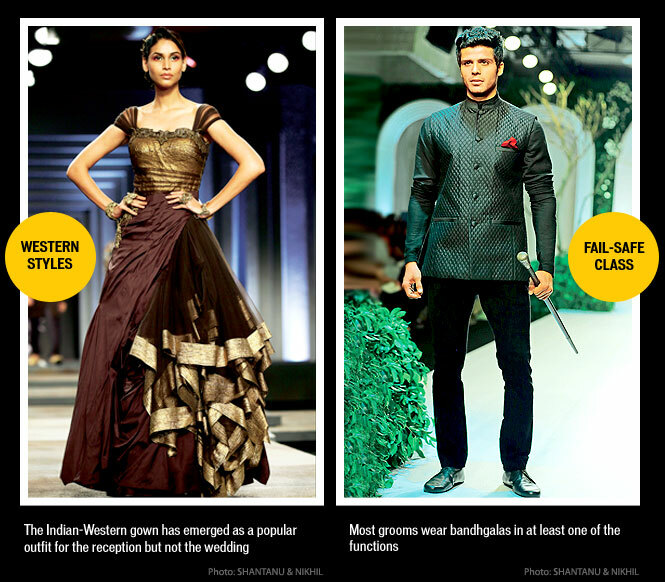 While sarees remain popular, it’s the lehenga that’s taking centre stage on the wedding day. “Lehengas are getting sexier, using unique materials and details. Regular sarees are sidelined for a more urban, re-stitched dhoti-style option, with long jackets, over strappy blouses” says Vallya. Falguni agrees. 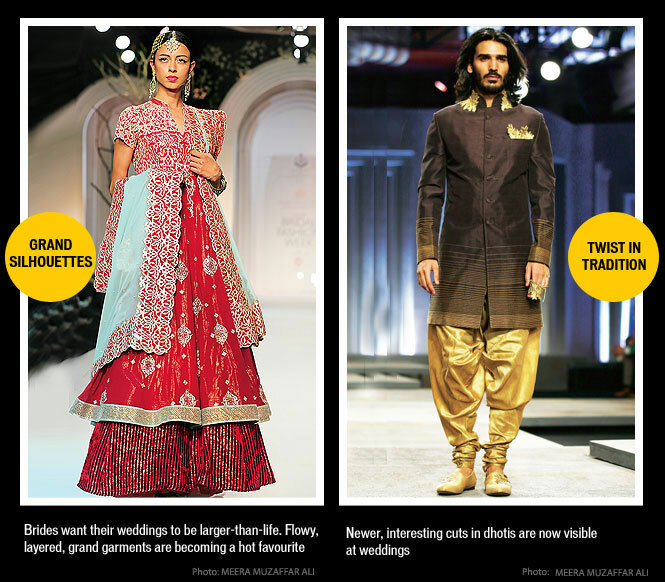 “Brides want their outfits to look larger than life, hence the whole craze of layers and flowy garments”. For the reception, think beyond the usual heavy bridal finery. The trend leans more towards floor-length jackets, Anarkali kurtas and churidars, straight kurtas worn with shararas and voluminous salwars. Fashion Police : Nothing is more unappealing than a fitted outfit on those who can’t carry it off. Wear a gown only if you can pull it off with confidence.